BLACK FRIDAY, EVERY YEAR WE HEAR AND SEE THE SAME RIDICULOUSNESS FROM FOOLS … LOOKS MORE LIKE THE HUNGER GAMES. Altercation at a WalMart store over big screen TVs. Even the UK got involved in the chaos. Police were called to the Walmart in Rialto, CA to break up a fight between two men that sent one police officer to the hospital. More than 3200 people lined up to wait for the 8 pm opening at the Walmart when the store made the decision to open the doors at 7 pm instead. And the chaos began. What could possibly go wrong with a massive crowd like this waiting to charge into a store? All of the people involved in the fights were taken into custody, but one of the men involved in the fight outside was arrested for suspicion of assault with a deadly weapon. Police officers descended on Walmart in Rialto after a brawl between two men injured a police officer who tried to break up the fight Thursday night. The injured officer was transported to St. Bernardine Medical Center in San Bernardino with a broken wrist, police officials said. A Walmart manager said the doors were originally scheduled to open at 8 p.m. but with the more than 3,000 people in line they made the decision to open the doors early, which police said led to the melee. Police said there were three fights total shortly after 7 p.m. at the store at 1610 S. Riverside Ave., two of which were inside over merchandise and the third outside that caused injury to the officer. 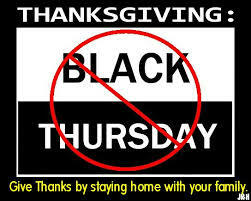 Great, so now we can expect shoppers behaving badly as stores like Macy’s, the Gap and Target opened their stores on Thanksgiving Day to create “Black Thursday.” Pretty soon Black Friday will go the way of the DoDo as all chain stores will be opening on Thursday night to get the jump on sales and insanity. UPDATE I: VIDEO of the disgraceful behavior from NBC-SoCal. Tensions were high at the retail giant’s Rialto location because shoppers were cutting in line, said Sgt. Nicholas Borchard, with the Rialto Police Department. At least three people were involved in the brawl and two have been taken into custody, Borchard said. A police officer broke his wrist as he broke up the brawl. The incident happened at 7 on Thanksgiving night at a Walmart at 1610 Riverside Ave.
UPDATE II: More Bad Behavior. A man in Claypool Hill, West Virginia, was slashed to the bone with a knife after threatening another man with a gun in an argument over a Wal-Mart parking spot, Tazewell County Sheriff Brian Hieatt told NBC station WVVA. Both faced charges after the incident that happened at 6:30 p.m. the station reported. Another shopper was charged with aggravated assault on a police officer after getting into an argument with a New Jersey Wal-Mart store manager about a television set, police told NBC New York. Officers arrived at the scene at 6:39 p.m. and once they had pacified the customer they also charged the shopper with disorderly conduct and resisting arrest, Garfield police told the station. Talk about providing the “black” in Black Friday … This might be the worse dsplay of behavior of all of the heinous events of Black Friday. Sorry, but there is a special place in hell for you. One might think that the following is a sign of the Zombie Apocalypse. Sadly, it is the masses acting like souless zombie. Across America yesterday, massive mob of foolish individuals knocked down the sales associates, fought with each other, kicked, punched and trampled over each other all in the name of Black Friday. No better or worse as the case may be, example of this behavior was at the Victoria Secrets at Woodland Hills Mall in Tulsa, Oklahoma. The masses did not act any better at the Victoria Secrets in the Oak Park Mall in Overland Park, KS either. UPDATE I: Dateline San Antonio, TX … man pulls gun on shopper who cuts line and punched shopper in the face. Those rowdy, inconsiderate idiots best beware of the those who have a valid conceal gun permit. UPDATE II:Black Friday shoppers smash door at Urban Outfitters injuring about five people in, Santa Monica, CA. UPDATE III: Black Friday Violence: 2 Shot Outside Walmart in Florida. Classless Masses Fight over Cell Phones on Black Friday … What Has Become of America? DISGRACEFUL: Once again we are presented with what is not the reason for the season … What the hell has become of our country? Sadly, folks reduced themselves to the lowest level of existence as they battled each other on Black Friday over cell phones. WTF!!! These fools battled, pushed, shoved to get phones as if they were Haitian refugees fighting for food following a massive and terrible earthquake. However, those in Hati were starving, Note to the morons fighting over phones … IT’S A FRIGGIN PHONE!!! Don’t you know that you can get your own free Obama phone? I guess when we have record number of Americans living on Food Stamps and record number of Americans unemployed, underemployed and no longer looking, this is what society gets reduced to.